With its peculiar wavy design in black and a contrasting silver frame border floating on top, the 8-inch HP Smart Wi-Fi frame is...well, funky looking. It is also quite obvious that the frame is plastic, which is unfortunate. Delving beyond its somewhat futuristic appearance, however, I found that the Smart Wi-Fi ($145, as of 11/25/09) has a refreshingly straightforward, intelligently designed interface with simple icons directing you toward audio, video, photo, and online content. The frame comes with a remote that lets you navigate with ease. Setting up the Wi-Fi aspect was a snap: The frame auto-detects local networks and asks you to enter your network key. You can then link your frame with online content through HP's Web site, with selections such as Facebook, Picasa, PhotoBucket, Flickr, YouTube, Internet radio, and a weather widget. In addition, using your account with HP, you can designate the phone numbers of people from whom you want to receive MMS photos. The 800-by-600 Smart Wi-Fi display has 512MB of internal memory. It also accepts CompactFlash, MS, SD, xD, and MMC cards, along with USB devices. For audio, the device will play MP3, WAV, and WMA files. For video, the display will run files in MPEG-1, MPEG-4, and motion JPEG formats. In my tests, I found the display quality to be quite good; photos looked crisp, if a little desaturated. Slideshows played smoothly, and video clips rolled without a hitch from my SD card. When I watched a couple of videos streamed from YouTube, the player worked just fine, with no hiccups--though image quality on YouTube, naturally, will vary. Searching for radio content was a little shakier. The display asks you what genre you want to listen to, and it then loads a list of stations to choose from. You can opt to play music while viewing slides, a standard option on wireless and conventional digital frames; but I found the Smart Wi-Fi's sound quality disappointingly tinny. HP has done a lot better with its DreamScreen. 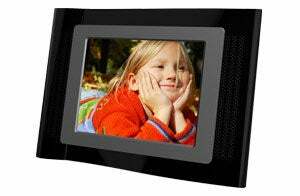 Overall, HP has made a good attempt here at creating a multimedia picture frame, as the Smart Wi-Fi display is very simple to use, with the bonus of MMS capability. The frame's main drawbacks are that plasticky build and its accompanying poor sound quality. Considering those stumbling blocks, the Smart Wi-Fi display is a little overpriced.